Custom Rally Towels Personalized in Bulk. Promotional, Cheapest in USA, Canada. Black, Navy Blue, Green, Yellow, Royal Blue, Red. Custom Rally Towels Personalized in Bulk. Promotional, Inexpensive. 12" x 20". Budget Prices for USA, Canada. Red, Black, Royal Blue, Green, Navy Blue, Yellow. Discounted bulk rally towels, personalized with custom imprint of your logo. Show your spirit with our economical cotton rally towels. Budget Prices in USA and Canada for personalized rally towels. American clients pay no taxes. Free artwork design. We supply 2 models of rally towels: Rally towels with 1 or 2 custom imprint colors, and rally towels with full color custom imprint (unlimited number of imprint colors). Please contact us if you require larger quantities of rally towels: we have fantastic prices for custom printed rally towels in large quantities and longer delivery (1-2 months). Standard Production Time: 5 working days after art approval; Rush 3-day production: add $0.25 per rally towel. Unit Prices below include your custom imprint in 1 color on 1 side. 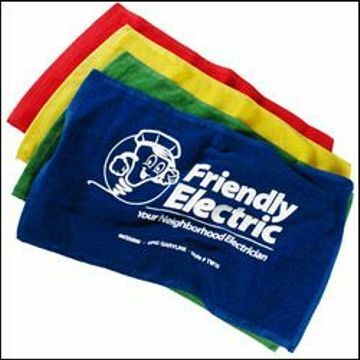 Add $0.35 per rally towel for a second imprint color. Additional Charge for 3-Day Rush Service: $0.25 per rally towel. • Vivid full color imprint. • Soft, durable cotton polyester fabric. • Great for sporting events and golf tournaments. Imprint Area: Edge-to-Edge: 11" x 18" Full Bleed. • Production Time: 5-10 days. Contact us for faster delivery. Full Color Setup Charge: $125.00 (one time charge, you don't pay it for repeat orders). Optional hook and grommet available for $0.45 each. Hook comes unassembled.